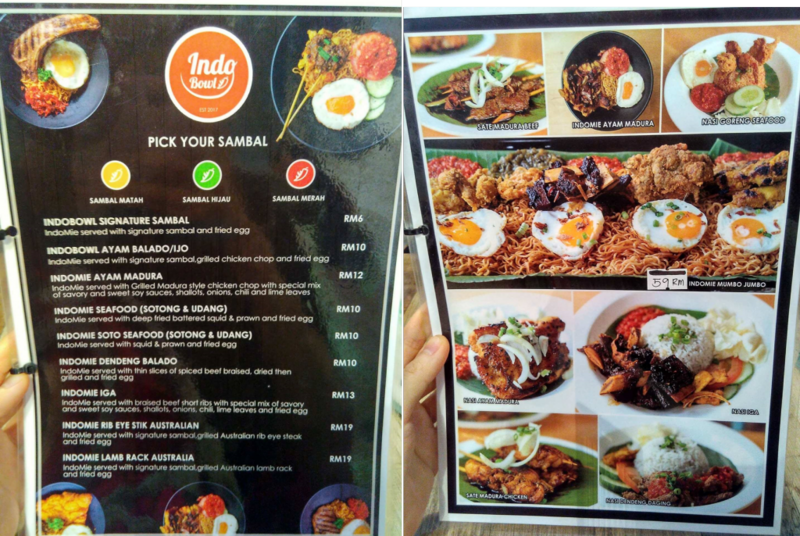 [DKL REVIEWS] Is The New IndoBowl Restaurant In Sungai Besi Really Worth Your Time? 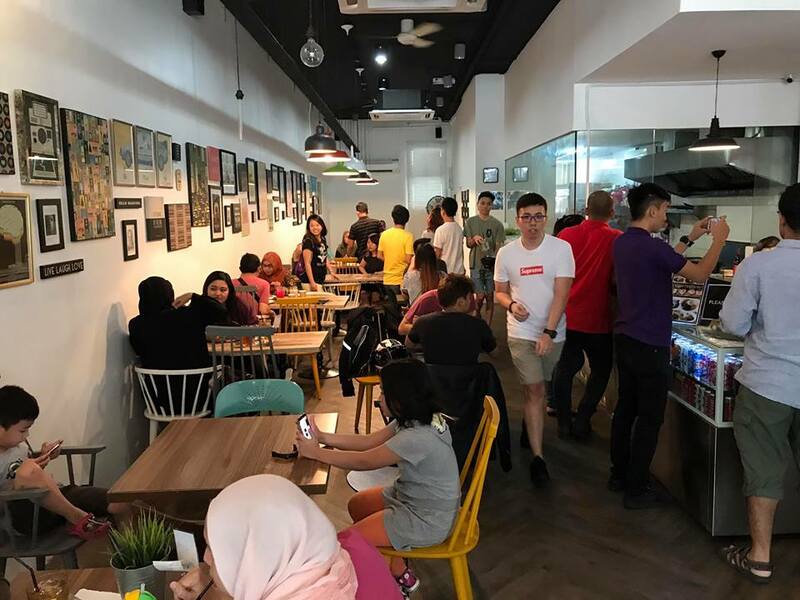 A new concept restaurant’s been the talk of the town for the past week and KL has its fair share of restaurants but none quite like Indobowl, the first Indomie restaurant in KL. During our recent visit to Indobowl, we took a drive down to Sungai Besi where the restaurant is located. Depending on your time of visit, there might be a crowd which would lead to a slight wait time. Upon walking in, we were already informed of this and so we were well aware that to produce our order of 3 Indomie Mumbo Jumbo sets, it would be a wait of 30 minutes—our order arrived in 20. It was fair enough considering that we dined in during a pretty packed dinner service and we had a huge order. While we waited, we had a chance to admire the framed artworks adorning the walls. 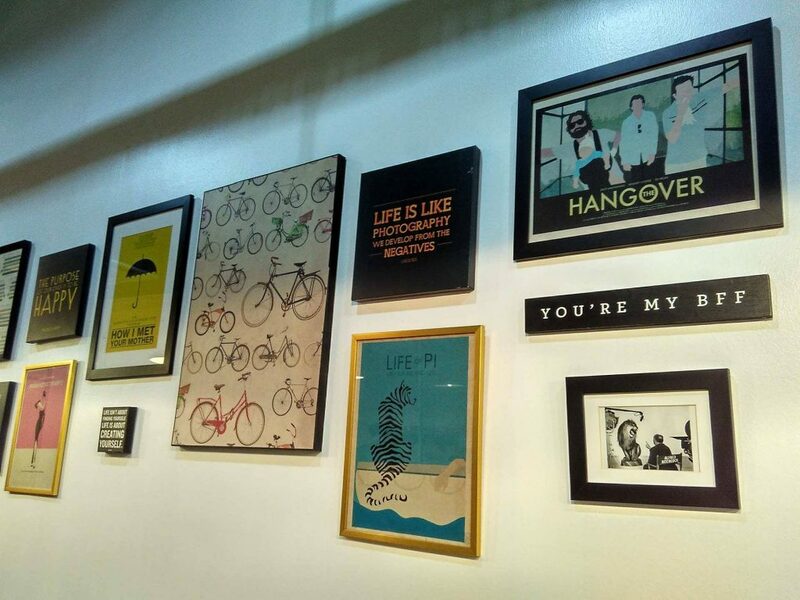 They were posters of famous movies and television shows, as well as quotes like “Happy Place”. Indomie might be classic mamak fare but Indobowl does not settle for a basic ambiance, setting the standards to be more of a restaurant with hipster vibes, and this extends to their cool furniture too. When the Indomie Mumbo Jumbo (RM59) arrived, everyone whipped up their phones to film Instastories and take snapshots for Facebook. It’s quite the beauty and it’s what every instant noodle fan would expect from a dish called the Mumbo Jumbo. 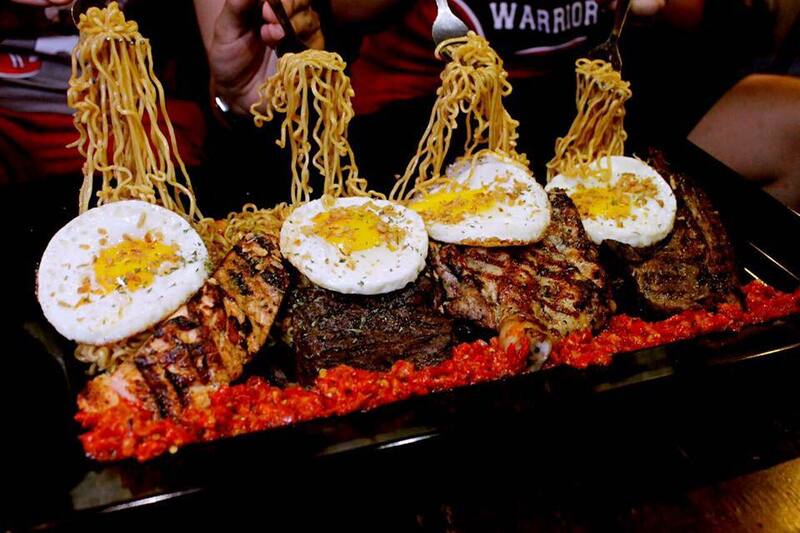 It’s got the springy, saucey Indomie goodness paired alongside 4 telur mata kerbaus, grilled chicken chop, beef steak, lamb chop and some fried shrimps. But what totally made the dish for us was the Indonesian sambal merah and sambal hijau. The chilli was flavourful and it had a strong kick to it. On the spiciness of the sambal, it was split right down the middle for our team. For those who enjoy spicy meals, it packed just the right punch for ’em, and for those who shied away from spice, it was a tad bit extreme and perhaps should then be enjoyed sparingly. As for the star of the dish, they were not overcooked. It’s easy to go off on the texture of noodles where it’s reduced to a pile of soft, overdone mess but thankfully, there’s none of that at Indobowl. Each Mumbo Jumbo is also made with 4 packets of noodles and it’s tough enough to distribute the sauce evenly with 1 packet of noodles, what more with 4? But the team at Indobowl did a decent job distributing the sauce evenly throughout the noodles. Where we had high hopes on the proteins, we were slightly let down by the fact that the meats could do with a couple more minutes on the grill just to give the exterior a little more colour and crunch. Having said that, the meats were not underdone and the flavours weren’t affected as the proteins were well seasoned. They also go particularly well with the runny eggs and make for a protein-rich meal, perfect for those who are bulking. For those who want to have the traditional Indomie Biasa, there’s the Indomie Signature Sambal (RM6). This one hit just the right spot for us. It was a simple bowl of satisfaction and sure, it’s bare basics but a pretty darn good bowl at that. 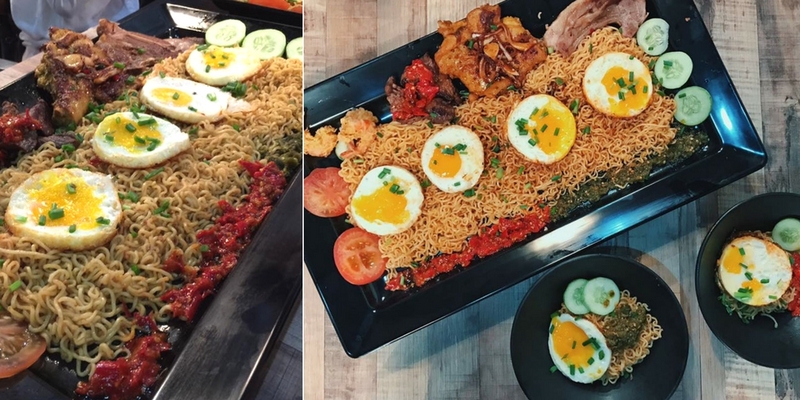 Now, for those who wonder if the Indomie served at Indobowl is any different from the ones we whip up at the comfort of our own kitchen, the answer is no. It’s arguably the same regardless of where you enjoy it but what takes Indobowl’s version to the next level is its Indonesian sambal because though they may be mere condiment served at the side of the platter, it packs a punch. Sure, Indobowl might require some fine tuning but it’s also got great potential. 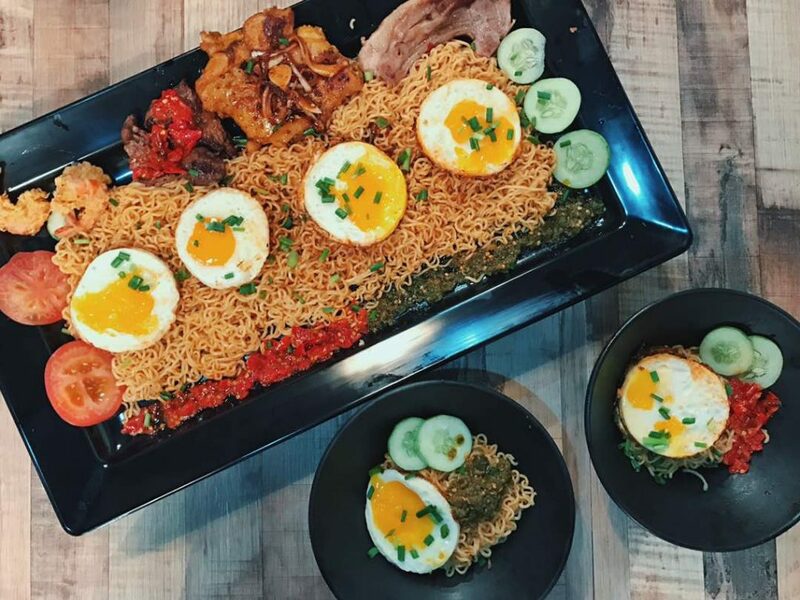 In its first few weeks of opening, they’ve already received plenty of attention and while the hype might die down a little with time, Inbobowl is able to bank on Malaysians’ general love and undying passion for Indomie. That’s because Indomie is a huge part of Malaysian culture. It represents the late nights spent with friends at the mamak, the after school dinner for when Mom’s not home to cook and the quintessential “broke at the end of the month” meal. And that’s something that’ll never grow old.